It has been a decade since Social Watch Philippines (SWP) convened the Alternative Budget Initiative (ABI). 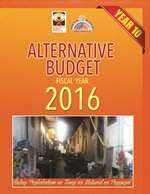 The consortium has now blossomed to around one hundred and sixty strong civil society organizations and individuals conducting research and lobby efforts in coming out with annual budget analysis, campaigning against lump sum funds, and engaging the national government and the legislature in the budget process by coming out with a civil society-crafted alternative budget, otherwise called as the Orange Book. Throughout the years, the effort of the consortium to directly engage through the budget process has led to the forging of partnerships with concerned agencies and champion legislators, expansion of the ABI network to more organizations and individuals who share SWP and ABI’s development vision through budget advocacy, and the continuing presence of the ABI in House and Senate to present alternative budget proposals. The ABI work has definitely gained significant strides in carrying out citizens’ participation in public finance through the budget as a tool to effect change towards improving people’s lives. Through our initiative, we continue to elevate an empowered citizenry at the center of good governance and the pursuit to sustainable development, affirming that citizens are all taxpayers who have the right and stake in influencing how the people’s money is being spent. The P3.002-trillion 2016 National Budget is particularly important to be strictly monitored as it still remained vulnerable to abuse and misuse. We found significant red flags in the retained provisions allowing status quo to hold – with the executive branch authorized to perpetuate artificial savings & discretionary budget transfers, amidst the controversies created by the Priority Development Assistance Program (PDAF) and the Development Acceleration Program (DAP), the practices in both of which were declared unconstitutional by the Supreme Court. The Filipino people have declared their condemnation of pork barrel and budget abuses. Petitions have been filed before the Supreme Court against PDAF-like funds and DAP-like budget transfers; while court proceedings are on-going against officials who were charged in the fraudulent spending of pork barrel funds. However, the Basic Law of the Land has still been violated because the framework for DAP and pork barrel still exist. The national budget still contains lump sum appropriations with PDAF- and DAP-like characteristics and mechanisms. We have been stuck at counting the leaves while we overlook the entire forest. By focusing largely on the budgets of agencies, Congress essentially yields its Power of the Purse to the Executive by passing a budget with most if not all lump sums, PDAF-like funds as well as savings and realignment provisions kept intact. Hence, SWP and ABI have remained steadfast amidst the challenges that have come the way of our budget advocacy. “Huling Pagkakataon sa Tunay na Matuwid na Paggugol” is a fervent hope that despite the budget vulnerabilities that continued to be set in place for the past budget years, the government will take as an opportunity to adopt our alternative budget proposals in order to forge a responsive and truly people-centered national budget. With the 2016 Budget essentially passed on to the incoming administration by July 2016, aspirants for public office should be able to articulate their position on the 2016 Budget and how they stand on important issues affecting the national budget – such as the diminishing Power of the Purse, discretionary lump sum funds, budget transfers and realignments, persistence of pork barrel, and the distortion of budget terms such as the meaning of errata as applied to the budget and the redefinition of savings. Importantly, we call on candidates to pronounce their concrete platform of government and policies on instituting reforms to the budget and public finance. In that regard, “Huling Pagkakataon sa Tunay na Matuwid na Paggugol” should also serve as a springboard for SWP-ABI and its network of campaigners to urging the next administration to come up with an approach in pursuing development and tackling the multi- dimensional problems of poverty, hunger and unemployment that goes through the lens of the poor and vulnerable. As we have experienced, a huge budget does not certainly ensure that economic growth is enjoyed by all, and a large portion is being utilized for partisan political purposes. It has to focus instead on the sectors where the poorest are and where unemployment is highest. As the Filipino people vote for new officials in the upcoming elections, SWP and ABI advocates should be able to popularize the importance of the budget as an election issue and as a genuine equalizer in addressing poverty and inequality. The Filipino people should be able to recognize that budgetary transfers and realignments are brought about by continued existence of pork, lump sums, and erroneous definition of savings and will make it difficult for the reduction of poverty, inequality and hunger as well as employment generation to prosper. To ensure a dignified and resilient future, we should choose leaders based on platforms on the budget and public finance which pursue sustainable development, uphold the Constitution and maintain balance of power in the government. By Prof. Leonor Magtolis Briones.